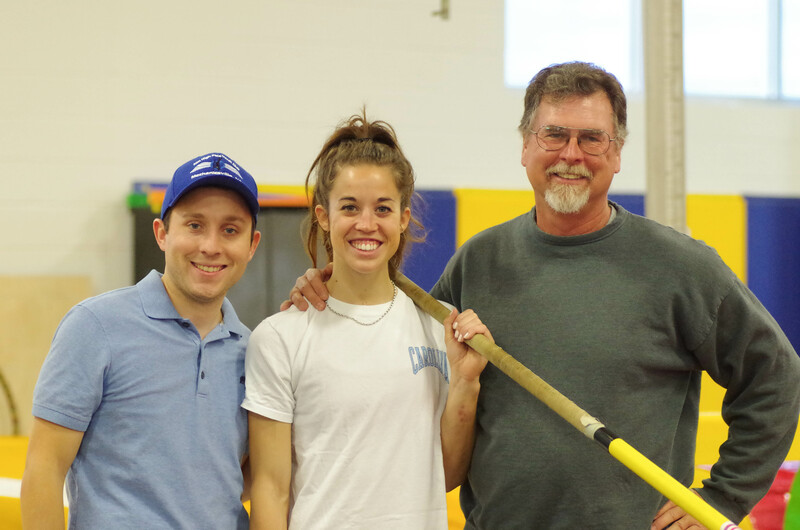 Eric Sandridge has been coaching Aim High Pole Vault Club vaulters since 2006. As an athlete under the tutelage of Kyle Bishop, Eric obtained numerous district championship titles and all-region awards during his time at Atlee High School. Eric later vaulted collegiately for the College of William and Mary. During his time as the pole vault coach at Lee-Davis High School in Mechanicsville, VA, Eric’s vaulters have won Capital District, Conference 11, Central Region, 5A South Region, and 5A State titles along with numerous other All-State and even All-American awards. In nine years coaching at Lee-Davis, Sandridge coached five different vaulters over 14 feet, including three in one year despite only two other athletes jumping the height during the previous 50 years. From 2013-2016, Sandridge coached Jordan Lipinski to three 5A state titles and a school record 11’9.” During the 2015-2016 season, Jordan Lipinski and teammate Yomna Soliman placed first and second at both the indoor and outdoor Virginia 5A State Championship. More recently, Sandridge coached Alex Slinkman to a school record 16’0″ and the indoor and outdoor Virginia 5A State Championships during the 2016-2017 season. Slinkman was named an All-American after finishing 6th at the 2017 New Balance Outdoor Nationals. In addition to coaching athletes at Lee-Davis High School, Sandridge has helped to develop numerous Aim High female vaulters to personal bests over 12 feet and male vaulters to personal bests over 16 feet.